Wax Trax! announces new release! Peter Hook is in the midst of his world tour performing full albums from his impressive career. He recently took time out of his busy touring schedule to answer fan questions submitted by Time Out Shanghai, and discussed the Hacienda, band chemistry, and more. As always, when Hooky speaks, it's pretty interesting. "It was Ian Curtis, God rest his soul, who encouraged me to play like that, and the reason I did it was because Barney was so loud the only way you could hear your bass was if you went up high and cut through. Ian really liked that style, he said, ‘It really drives it along, do that’." "[Ian] was a great fan of Kraftwerk, so I fully expect that he would have been very happy, especially with the way it was going, with songs like ‘Isolation’ and ‘Something Must Break’ getting into a dancey groove. He would have gone straight into ‘Blue Monday’ and all the rest of it." "The whole rock ‘n’ roll world is a myth, and if you let people backstage, it probably wouldn’t be half as attractive...Nobody wants to think that four idiots off their heads on booze and speed could make Unknown Pleasures...The myth of New Order was fantastic, up until we split in 2006, and now we’re just another bunch of arguing middle-aged men, mainly arguing about money, which is the most unromantic thing in the world." Read the full Q & A with Hooky here. Don't miss Peter Hook on tour in North America performing Low Life & Brotherhood in full along with other gems from New Order's collection (each show begins with a short Joy Division set). Three additional shows in California (11/24 - 11/26) have been added to the end of the tour; two of those shows are different from the rest of the tour -- on 11/24 Hooky will perform Movement & Power, Corruption & Lies, and 11/25 he'll perform full Joy Division albums Unknown Pleasures and Closer. 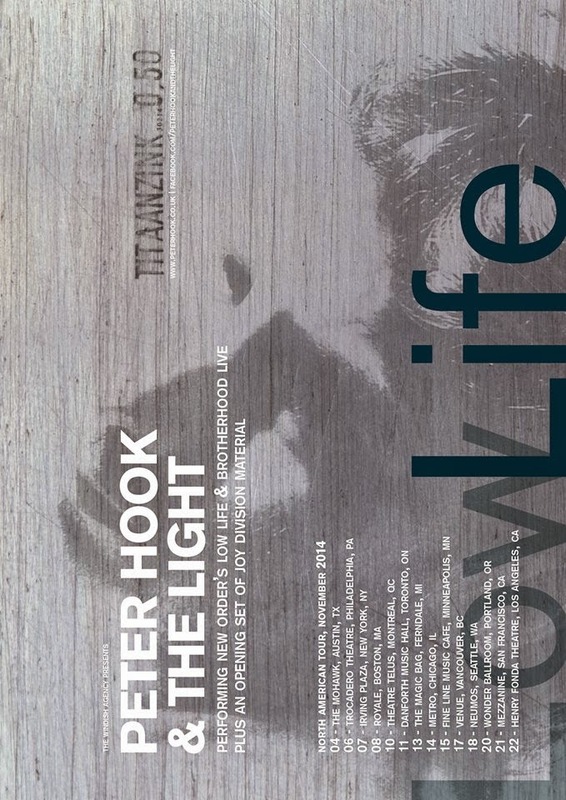 For more on Peter Hook, visit his official website.